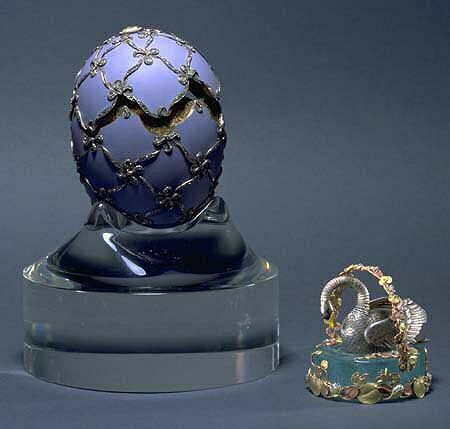 The beautiful 1906 Swan Egg is made of gold, matt opaque mauve enamel, rose-cut diamonds and portrait diamonds. The miniature swan is made of quatre-couleur gold, silver-plated gold and aquamarine. 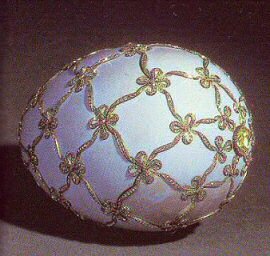 The gold Egg is covered with matt mauve enamel within a twisted ribbon trellis of rose-cut diamonds. The top, designed to conceal the division when closed, is surmounted by a large portrait diamond covering the year, "1906". Another large portrait diamond is set at the base where a monogram probably once appeared. 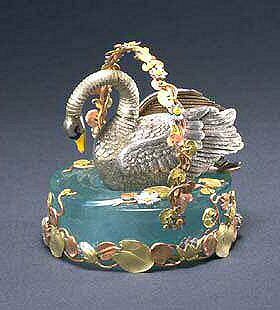 Lifted by a handle formed of water lilies in four colors of gold, a miniature lake composed of a large aquamarine, is revealed, upon which rests a superbly chased silver plated gold swan. When wound up under one wing, a mechanism is activated and the swan advances and starts to spread its wings showing each feather separately, moving its chased gold feet, the head and neck rise up proudly and then come down again. 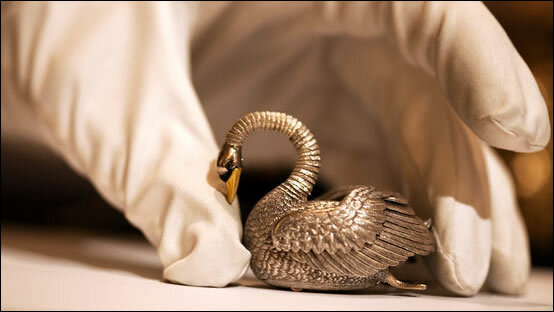 The miniature swan was made after James Cox's Silver Swan in the bowes Museum in England. 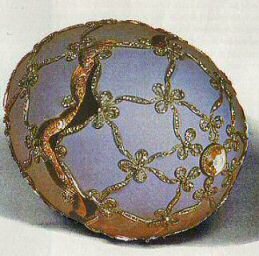 Fabergé probably saw the swan on the "Paris Exposition International Universelle" in 1867. The miniature swan is an example of the unsurpassed skills of his workshops. In 1940 the "mechanical swan on an aquamarine lake" was so highly regarded that it was quoted as being worth more than $ 100.000. 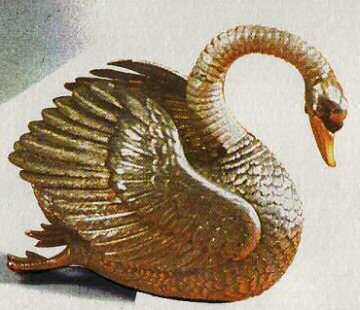 In 1927 the Swan Egg was one of the nine eggs sold by the Antikvariat in Moscow to Wartski in London. In 1933 sold to Charles Parsons, London. 1939 sold by the Hammer Galleries in New York on behalf of Charles Parsons, to King Farouk of Egypt. In 1954 sold by Sotheby's Cairo in the by the new Egyptian government ordered "King Farouk sale" to A La Veille Russie, New York. Sold by them to Dr. Maurice Sandoz, chemicals magnate in Switzerland. 1958 Collection of the late Dr. Maurice Sandoz, 1977, Collection Edouard and Maurice Sandoz, Switzerland. 1995 Fondation Eduourd et Mourice Sandoz, Lausanne, Switzerland.